If you have just one day in Venice, which places should you visit? How do you make sure that you do not miss some important tourist hot-spot? 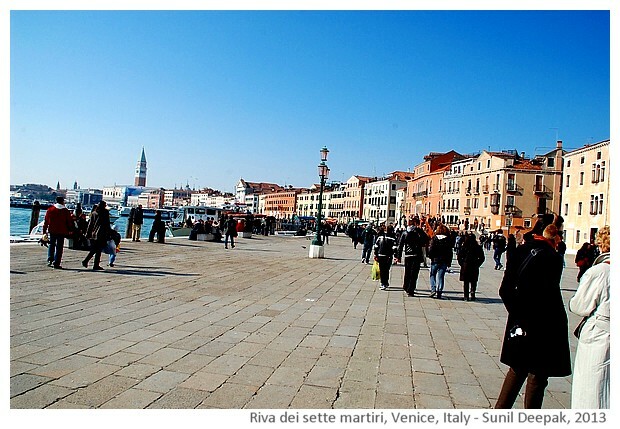 Is it better to walk or to take a boat for sight-seeing in Venice? Often friends coming to Italy for a few days and hoping to visit all their favourite places in those few days, ask me such questions. If you have similar questions, please read on - this post is written for you. It is a result of innumerable trips that I have made to Venice over the past 30 years, to accompany friends and relatives. I have been to Venice a lot of times, some times to accompany friends and relatives for a day tour and much more often, for my own pleasure - to discover new and unseen places in the wonderful water-world of Venice. Even after so many visits, Venice continues to be a magical place. It is considered as the ultimate romantic city, the city for the honeymooners. However, don't worry if you are alone - the city will still take your breath away - you will only wish that you can come back to visit it with your loved one! Usually when you have heard so much about some place, finally when you get the chance to visit it, you may end up feeling a little disappointed! All the hyperbole creates some unrealistic expectations. But no hyperbole is really exaggerated for Venice - I have yet to meet someone who feels let down by it! So, fasten your seat belts and lets start. Venice is a group of islands, the main ones are connected to the city of Mestre on the mainland by a bridge. Mestre has an international airport connected to the major cities of Europe by daily flights. 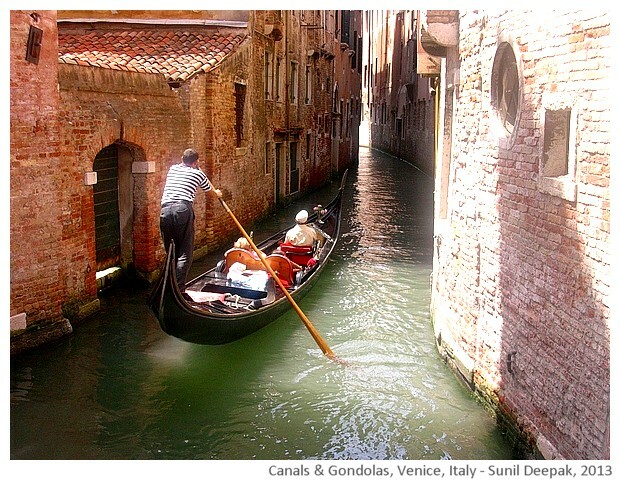 You can also reach Venice by car. As you cross the bridge to Venice, you will be asked to park your car in one of the islands that is used as a multi-storey car park. 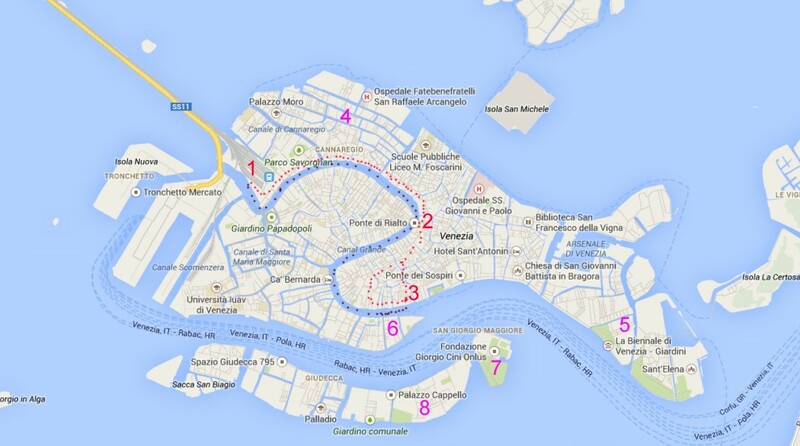 In Venice, cars are not allowed, and all travel inside the city has to be on foot or by boats. You may also park your car in Mestre and then take the train for the 5 minutes journey to Venice. 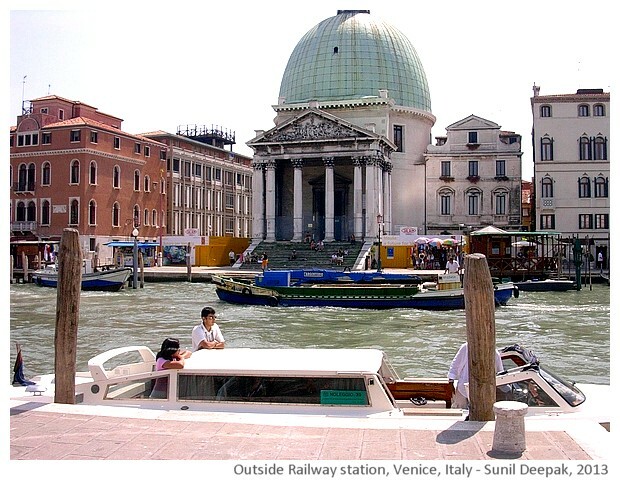 The most common and convenient way to visit Venice is by train. The only problem is that there are no trains between 8 PM and early morning. Thus, if your dream is look at Venice in the romantic light of the night, you need to spend the night in Venice. Once, I had missed the last evening train in Venice, and spent the night sitting on the stairs outside the railway station. I remember that night as a special experience. How ever, that was more than thirty years ago when I was considerably younger. If that happens today, I am sure that I will need to look for a hotel - Venice is full of hotels, though they cost a lot! 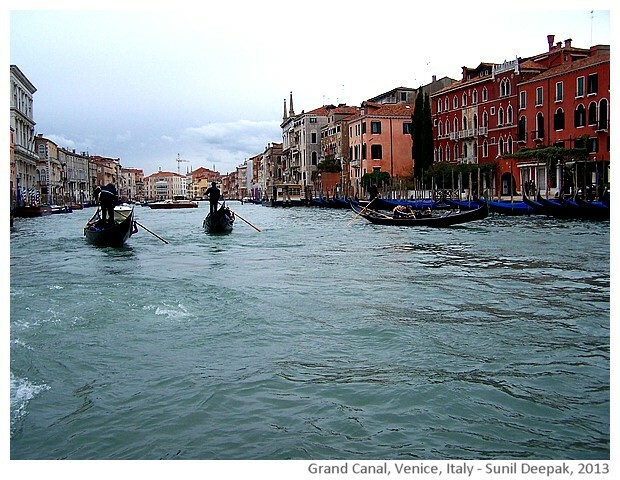 OK, so you have reached Venice by a taxi, car or a train, where do you go? Car and taxi will drop you at Piazzale Roma, from where you can walk to the railway station. If you are wise and have taken a train, you will reach Santa Lucia railway station. So I will start my day-tour from this station. Venice is an end-station - this means that trains do not go any further, but they need to go back the way they have come. As you come out of the railway station, the steps will lead you down to a big canal - Canale Grande, the biggest canal of Venice. Across the canal you can see a church (image below) - that must be one of the most photographed churches in Venice because it is the first sight of magical Venice for most persons. If you stand on the stairs of the railway station, on your left you will see a bridge, Ponte degli Scalzi (Bridge of the shoeless). 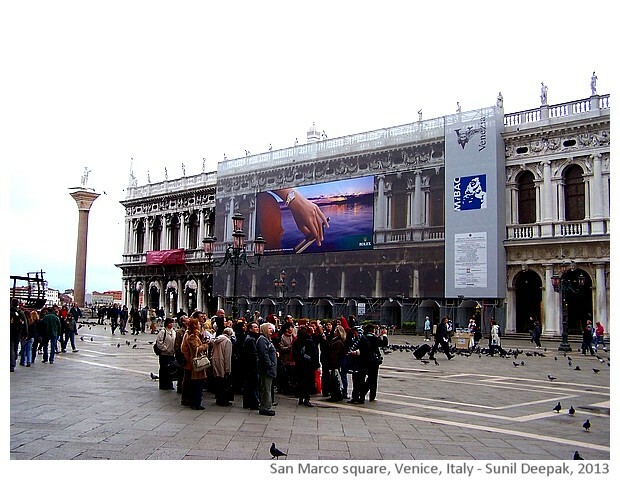 To the left of the bridge, you will see a yellow sign board on the building, showing an arrow with the words "A San Marco" (To San Marco square) as shown in the image below. 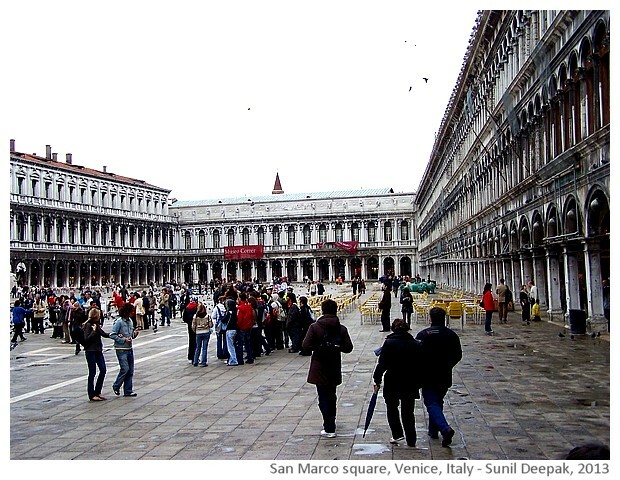 San Marco square, the most important landmark of Venice, is our destination for this one day visit. All the way from the railway station to the San Marco square, keep looking up for these sign boards as you go up and down the pathways along the canals and bridges of Venice. This will ensure that you will not get lost. On this walk, hidden behind the buildings on your right side is the Grand Canal. So if curiosity takes you away from the main path into small calle (streets) and you get lost, ask persons for "Canale Grande" and soon you will be back on the right path. Another easy way to reach San Marco square is to follow the crowds - Venice is usually so full of tourists, that you only need to follow them and they will lead you along my tour itinerary. Take a look at the map below to see the general route of our walking tour (click on the image to open a bigger map). 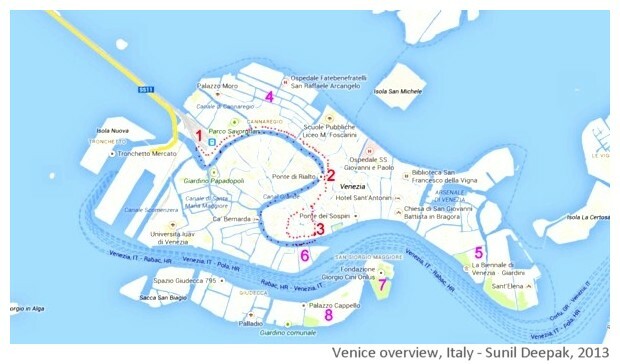 We start from Railway station (number 1), go along the Grand Canal through Rialo bridge (number 2) and then turn left to our destintion San Marco square, marked as number 3 on this map. The walk from the railway station to San Marco square is the most touristy part of Venice. Still along the way, you can get a few glimpses of the daily lives of people who live here, such as the fruit and vegetable stalls. However, most shops and restaurants on this route are targeted at tourists. Remember to look up to see the Venetian style of renaissance architecture and old houses of Venice. For a better look at the daily life of people who live in Venice, walk down any of the narrow pathways along the lateral canals near the bridges and you will find yourself in a calmer and a different world compared to the crowded paths used by the tourists. Half-way to the San Marco square, you will find some sign boards pointing towards the Rialto bridge, the most famous bridge on the Grand Canal. 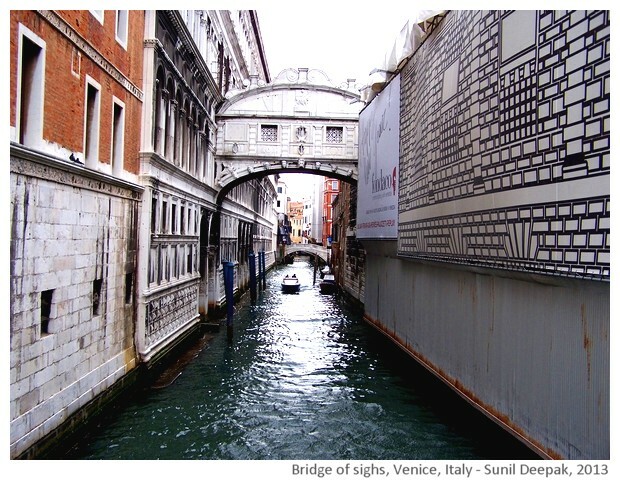 If you walk towards Rialto bridge you will reach the rectangular San Bartolomeo square. From this square, on your right side will be Rialto bridge and on your left, different small streets going towards San Marco square. 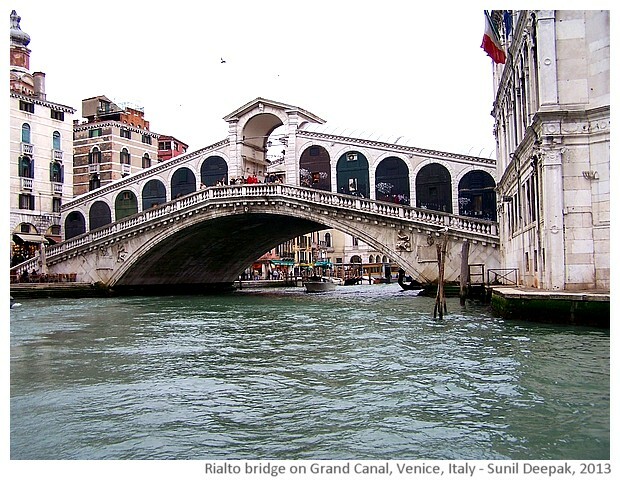 I suggest that you visit the Rialto bridge. Like Ponte Vecchio in Florence, Rialto bridge also has shops selling gold and jewellery. However, the most important thing about this bridge is to look at the wonderful noble houses lining the two sides of the canals and the different boats including the narrow gondolas crossing the canal. Rialto bridge is the place where Shylock, the Jew money-lender of William Shakespeare's celebrated play "Merchant of Venice", has his shop. It is an example of the usual stereo-typing of the Jews in the antisemitic Europe, how ever it is little late to make Mr. Shakespeare change his play now. Among the boats, you will easily recognise the narrow black boats with boatmen (gondolieri) wearing striped t-shirts and hats with matching ribbons - these are the famous gondolas of Venice. 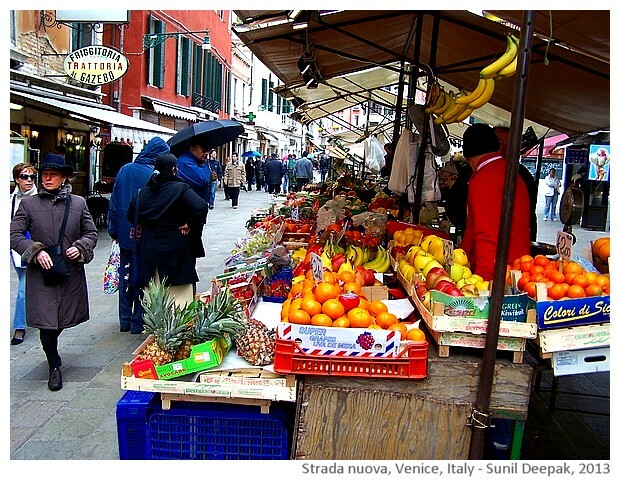 If you have time, you can cross the Rialto bridge and go down on the other side to visit the fish market area. After spending some time admiring the grand canal and Rialto bridge, come back to the square (Campiello San Bartolomeo). Any of the side streets on the other side of this square, will take you through a maze of narrow streets to the San Marco square. Along the path from the railway station to the San Marco square, there are different places, usually near the bridges, for renting a Gondola for a short (and costly) romantic ride on the canal. 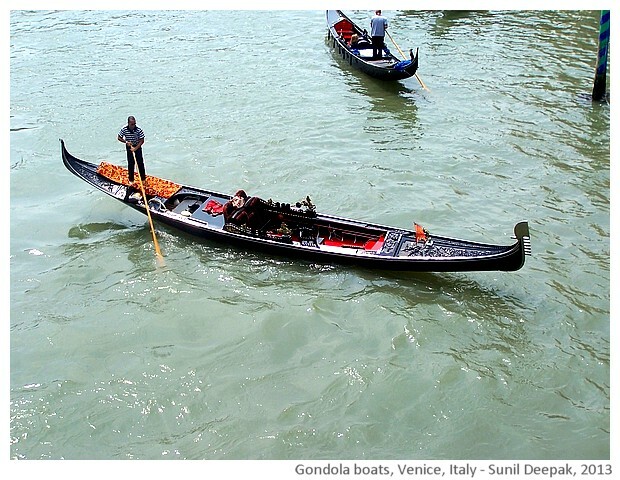 You can easily see the gondolieri boatmen in their striped t-shirts waiting for the passengers for the gondola ride. 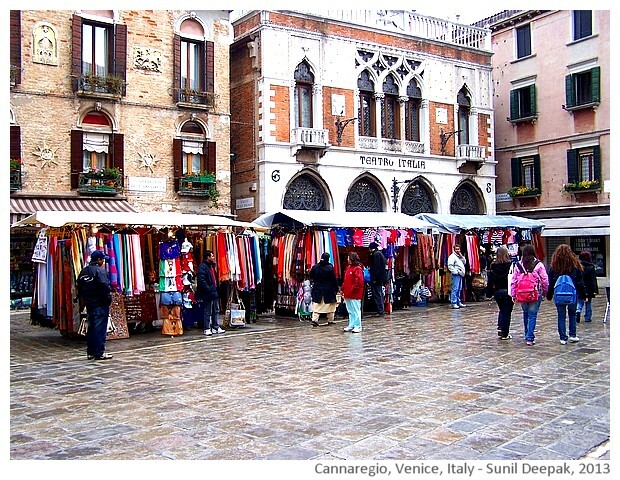 As you come out in the San Marco square from one of the narrow winding side-streets, it is an "Ah-ha" moment. The large open space of the square, the richly decorated buildings, the sight of the sea and the islands, the carved columns with sculptures and hundreds of pigeons, together create an the unforgettable view of one of the most famous squares in the world. 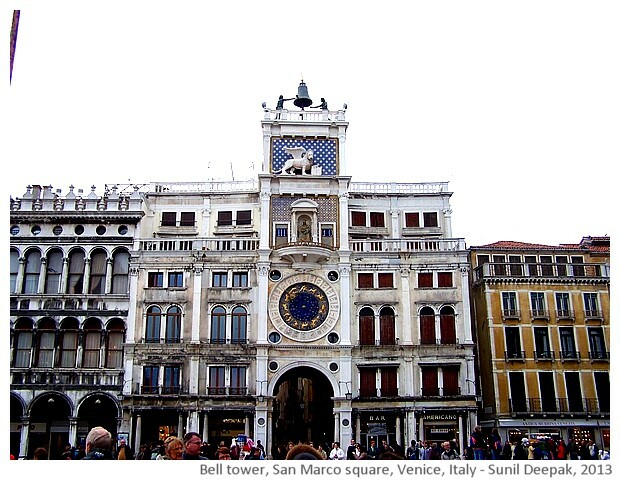 The "L" shaped square has San Marco church with bronze horses, the bell-tower, the clock tower with two clock-men (Mori), the Doge's palace and the twin columns. Here you can visit the church for one of the most beautiful mosaics in the world (and many other wonderful paintings and sculptures), go up the bell tower and visit the Doge's (Prime minister of ancient Republic of Venice) Palace. You can also buy corn and feed the pigeons, making them sit on your hands and your head. Or you can just walk around, dazed with so much beauty surrounding you. Finally do not forget to walk towards the twin columns and the sea, and turn left. From the first bridge, if you look at the canal passing behind the Doge's palace, you will see the famous Bridge of Sighs, where prisoners were taken to the jails in the underground cellars. Usually this place has groups of tourists huddling together to click pictures, so it is easy to identify. If you walk quickly and do not stop on the way, you can do the walk from the railway station to the San Marco square in about 30-40 minutes. If you wish to stop and admire the different buildings, click pictures, visit the Rialto bridge and the fish market on the other side, the same walk to San Marco may take up to 2-3 hours. 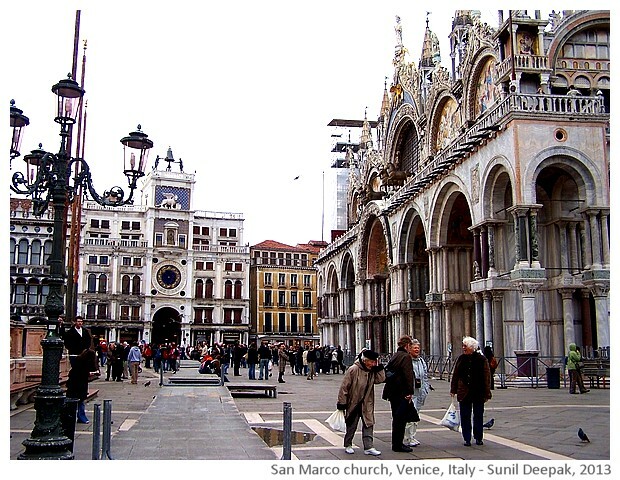 In San Marco square, if you do not visit the church, bell tower and the Doge's palace, but simply walk around, then you will still have lot of time. However, if wish to visit these places, another 3-4 hours can go away quickly. I personally recommend, the climb up the bell tower for beautiful views of the city from the top and at least a quick visit inside the church. For going back to the railway station from the San Marco square, I suggest that you take the public transport - boats called Vaporetto. 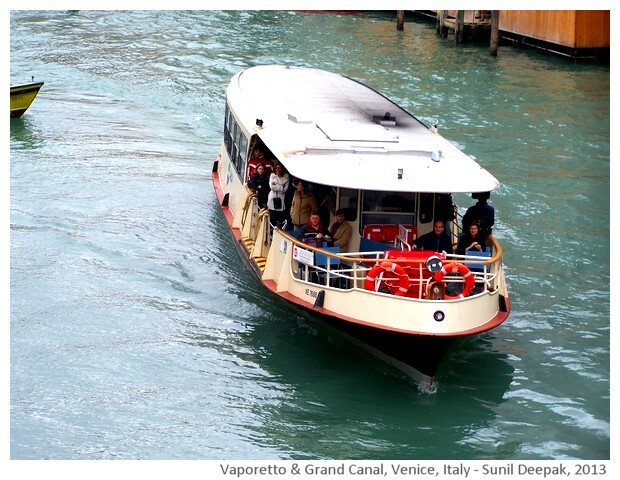 There is a Vaporetto line doing all the Grand Canal - it goes zig-zag, touching the two sides of the Grand Canal and stopping at every 200 metres. Try to get a seat with a good view and you can have a close view of the beautiful palaces of Venice like the famous palace of Desdemona or the building of the Venice Casino. Journey from San Marco square to the Santa Lucia railway station on the Grand Canal vaporetto takes more than 1 hour, so remember to start in time for your train. 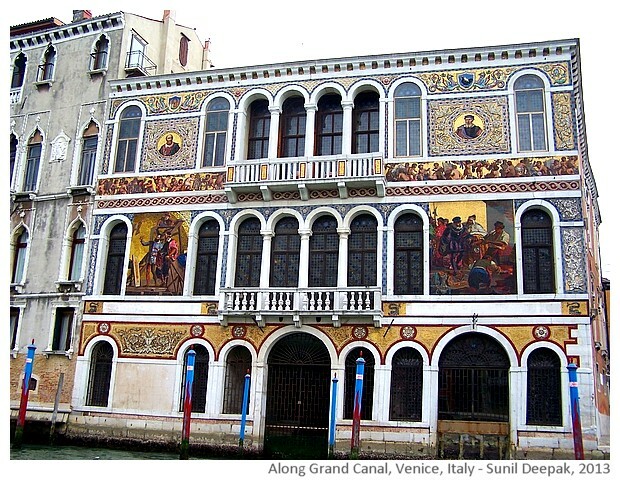 Most houses in Venice have a canal in the front or in the back. Thus, many residents of Venice have their own boats. 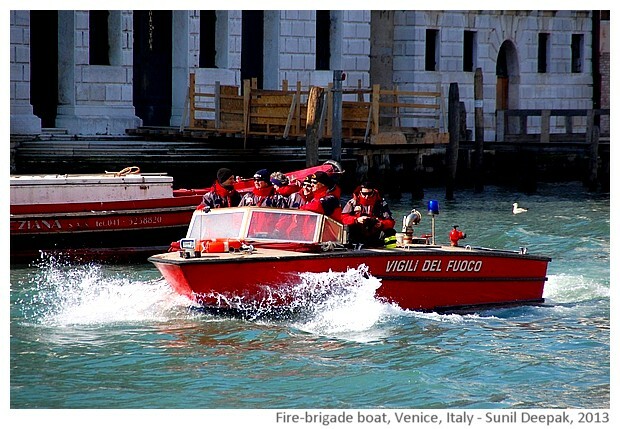 From postmen to ambulances to the police and the fire brigade, everyone moves on boats. If you keep your eyes open, you can recognise many of them. I love looking for these kinds of boats in Venice. 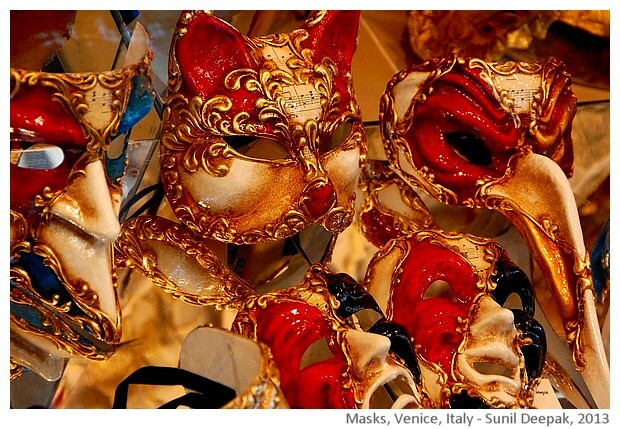 For shopping, Venice is known for Venetian glass, masks and corals. I especially like buying souvenirs such as clocks and flowers made of Venetian glass. 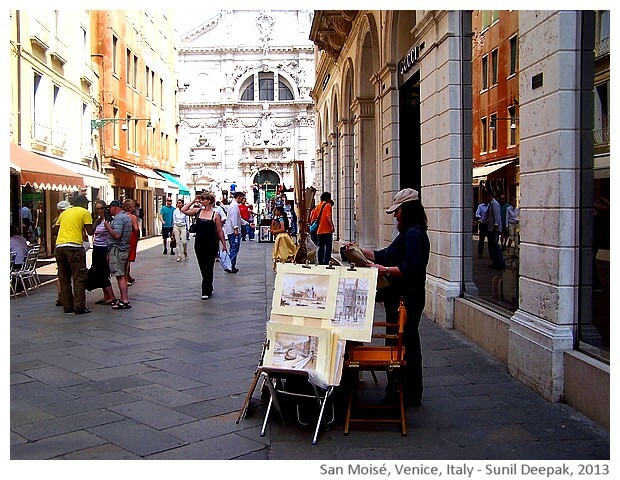 (1) Take a longer route to San Marco from Rialto bridge: Instead of taking one of the side-streets in San Bartolomeo square, go to the end of the square and take a round about route that comes back to San Marco square from the opposite end. This gives you an opportunity to see another less touristy (relatively) part of Venice and the San Moisè church. Remember however to keep a map of Venice with you. It is easy to get lost and walk around in circles. It happens to me all the time since I think that I know the place and never carry maps with me, and do not like to ask people for directions! Outside the main tourist paths, signboards are few. 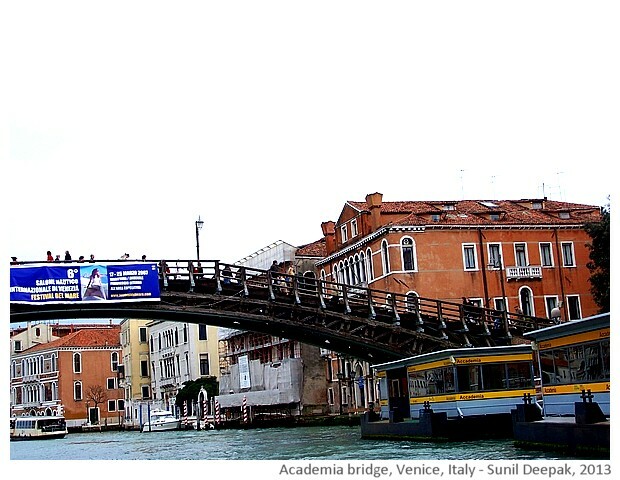 (2) Academia bridge and Sant Maria della Salute church: From Rialto bridge, you can follow the indications for Academia, cross this bridge and go on the other side of Canale Grande to visit the university area, Guggenheim museum and the Basilica of Santa Maria della Salute (with beautiful paintings by Tintoretto). 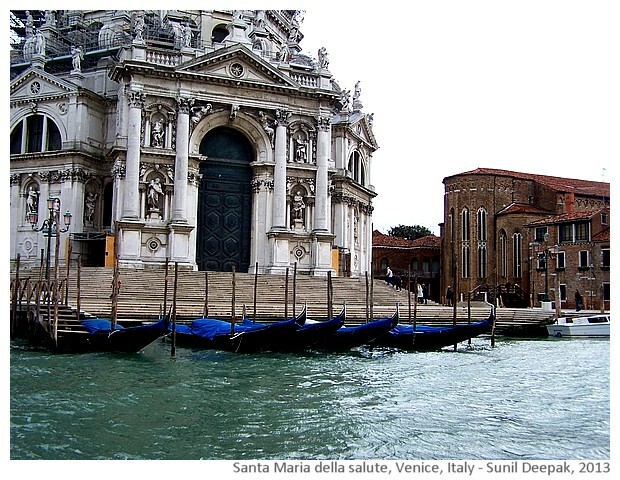 Santa Maria dell Salute also gives you a different view of San Marco square across the Grand Canal (area 6 on the map). 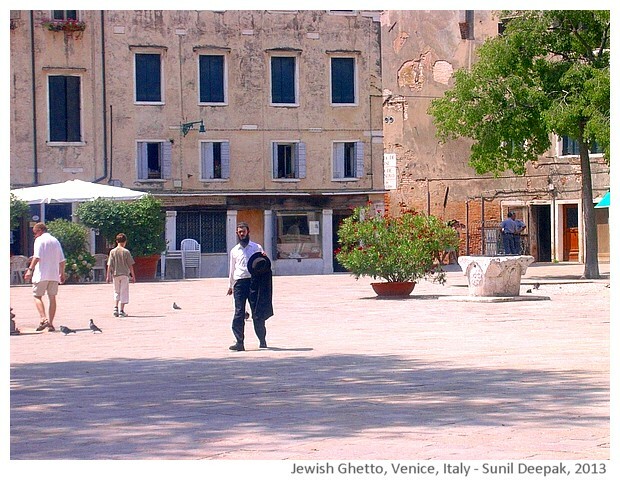 (3) The Jewish Ghetto: Though Jews had lived in Venice since very old times, during different periods of history they were forced to live inside the "Ghetto". As you start your walk towards San Marco from the railway station, after crossing the first bridge, you can take any path going towards the left (towards San Leonardo or Cannaregio), and you will reach the ancient Jewish ghetto part of Venice (area 4 on the map). 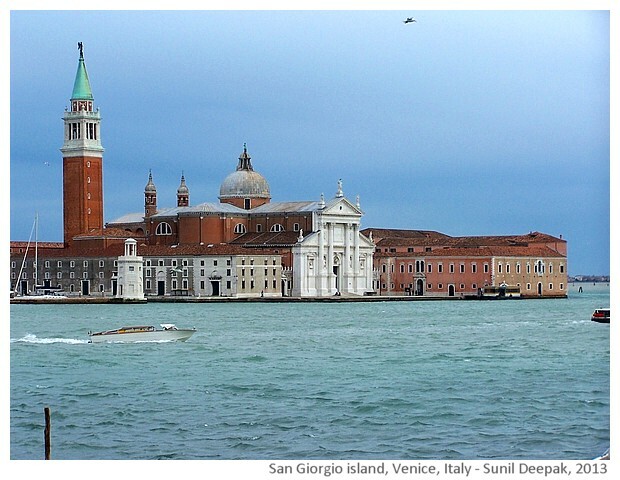 (4) San Pietro island and Giardini: From the Bridge of Sighs, continue on the Riva (bank) to the public gardens and then turn left on Via Garibaldi, go along the canal called "Fondamenta Sant'Anna" and cross the bridge into San Pietro island for visiting the San Pietro church (area 5 on the map). 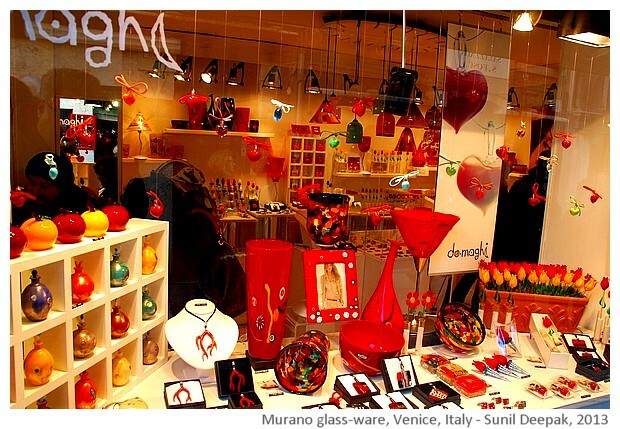 (5) Visit other islands - there are two islands famous for the Venetian glass - Murano and Burano. Visiting each of these requires, an additional 2-3 hours. 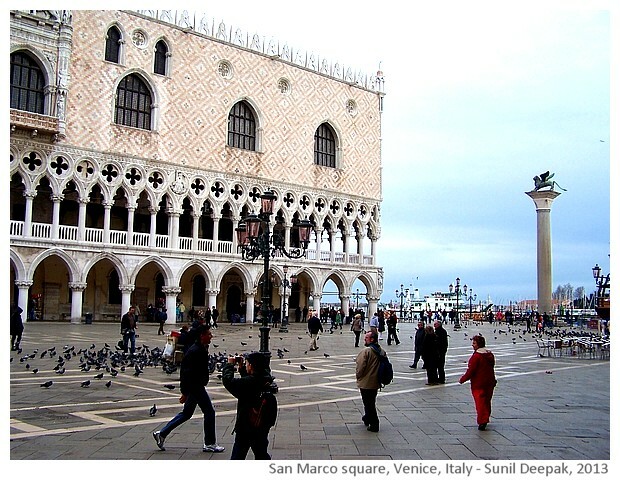 You can get the public transport (vaporetti) to visit these from the San Marco square. 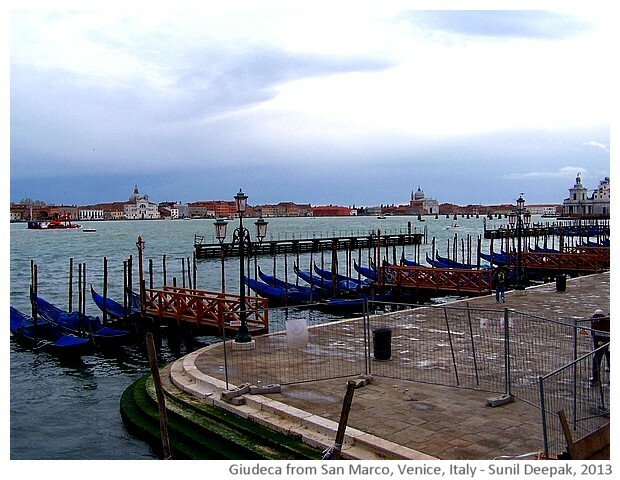 However, even with limited time, you can visit San Giorgio and Giudeca islands (areas 7 and 8 on the map), that you can see from San Marco square. You can also get vaporetti for any of these islands from San Marco. The beauty of Venice lies in the unusual combination of canals and the beautiful buildings, rich in architecture, art and culture. Apart from visiting the famous sites like the Rialto bridge and the San Marco square, the joy of Venice lies in going around without a fixed plan, getting lost in the warren of pathways and canals, visiting local churches for architecture and art, and admiring the unexpected squares surrounded by old houses. Summer is the tourist season in Venice, but I also love visiting it in winter, when tourists are few (except during the Christmas-New Year period) and especially with the snow. 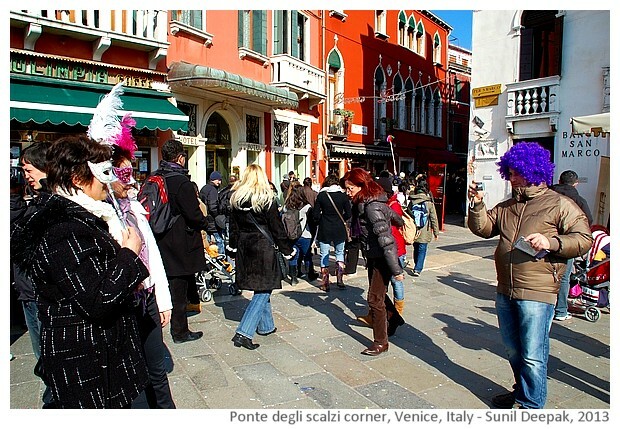 Another special period to visit Venice is during the carnival - but that will require a separate post. This is a good post. This post gives truly quality information. I'm definitely going to look into it. Really very useful tips are provided here. Thank you so much. Keep up the good works. International Boat Shipping.